A free, excellent app for watching Hindi serials and movies on your WP smartphone. Smartphones are more than just communication devices, and multimedia playback has become a huge part of the experience. Moreover, internet connectivity opens up a whole new world of online videos to the user. 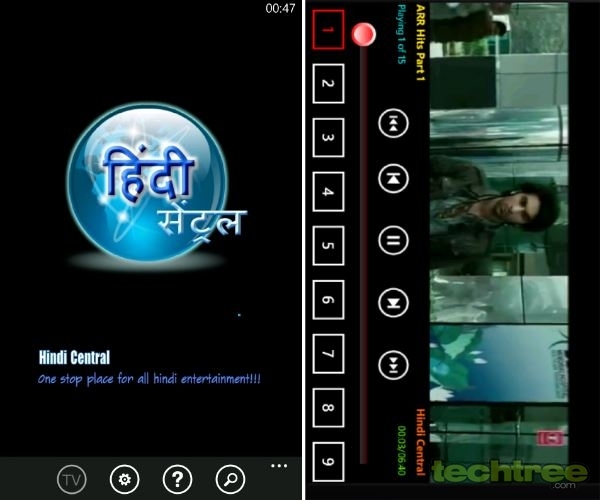 Hindi Central is a Windows Phone app that lets you stream Hindi TV shows and movies on the go. Of course, you will need a fast 3G or Wi-Fi connection for the best viewing experience. The app can be used to view the latest episodes of your favourite soaps, comedy serials, reality TV shows, and music videos. It also shows full movies, including those released this year. Sporting a simple interface, the software displays a list of the available videos under several categories, along with a search function. At the bottom of each screen, the programme displays ads to help generate revenue for its developer. However, ads do not show up while actually watching a video, which is nice thing to do. The app also has a TV Mode, in which you can create a playlist of videos for extended watching sessions. You will need a YouTube account to use this feature though. It's unclear where exactly the app sources its videos, since it comes from an unknown, independent developer. However, since you're not storing any of the videos on your phone, you have nothing to worry about from a legal standpoint. Even so, in case you decide to enter your YouTube account login details into the app, create a separate "fake" account first and provide that info instead. The app itself recommends the same thing. Check out the image gallery below for more screenshots.